I’m loving camel so much this season and this Topshop camel coat has been on constant rotation and a staple for my closet. The coat I’m wearing here was purchased in a Petite size but it has sold out since. I linked another camel coat here. Camel is such a versatile, neutral color and I loved pairing it here with a fun color in this chartreuse, colorful mini skirt. I’m slowly adding more color into my wardrobe as we begin to transition out of Winter. Hello 2017! This my first blog post of the year and I want to apologize for being so MIA these past few months. I’ve been juggling being a girlboss/wife/daughter/sister/friend. I spent A LOT of time since September traveling back and forth to San Francisco as we opened our first Morning Lavender Boutique! It has been an intensely rewarding last few months and I’m so proud of what our team has accomplished! Things are finally settled at our SF boutique which means I will be home a bit more and able to get back to some of my regular routine like blogging! I’ve been living in this cozy and stylish off the shoulder camel sweater. I love wearing trendy pieces that are also extremely comfortable and versatile. I also finally got the chance to wear these Stuart Weitzman Highland Over the Knee Boots that I bought for myself over Christmas. I’ve been eyeing them for so long that I decided to finally #treatmyself and give in to these beauties. I am surprised at how comfortable they are and so far they have not scrunched or sagged down which I found to be a problem with other suede over the knee boots. I love them so much already that I’m contemplating getting them in black too! Say hello to the perfect fringe shawl! I’ve been wearing this cozy cardigan everywhere – over a slim black dress like this or paired with my favorite high-waisted jeans and booties. It has the perfect amount of drape, comes in a gorgeous taupe color and looks way more elegant than the price. Note: it’s sold out in size Small (which I’m wearing) BUT I’ve tried on both the size Medium & Large and the main difference in sizes is the length of the back. I almost went with the Large size because I wanted a longer length in the back! Hurry and get yours because they have already sold out in our San Francisco boutique! I also wanted to take some time today and thank everyone for the support of my boutique business! We recently opened our first Morning Lavender brick-and-mortar boutique in San Francisco so I’ve been commuting back and forth from Orange County on a weekly basis as we staff the store and get things settled! It has been a DREAM and we are overwhelmed with all of the love and support. I haven’t had much time for myself lately, especially to shop so the blog has been a bit slower but I promise to get back to styling some great looks for you all! Today I’m sharing one of my favorite pieces from my boutique, Morning Lavender!!! We recently released our Classic Collection, a special curated and designed collection of feminine favorites that we believe will never go out of style. 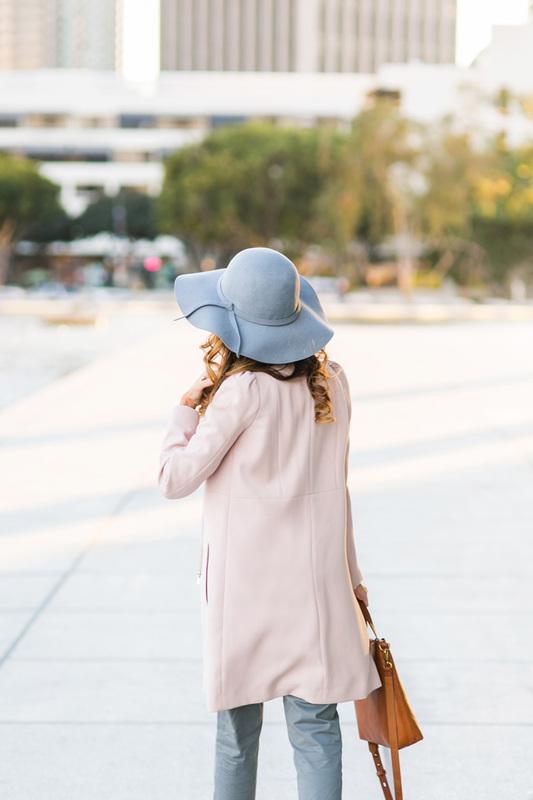 One of the pieces we absolutely love is our Madeline Pink Bow Coat. With it’s feminine silhouette, pink bow accent and gold buttons, it’s hard not to see why it’s a must have for every girlie girl! So today, I’ve teamed up with our shop to GIVEAWAY one pretty Madeline Pink Bow Coat to one lucky winner! The contest will run on Instagram only so be sure to find me on Instagram: @laceandlocks and follow the details to enter! I’ve been living in layers now that I am traveling quite often to chillier weather in San Francisco, CA. My favorite layering options that keep me comfy and warm are HEATTECH basics from Uniqlo. These simple pieces are lightweight but also features heat retaining technology to keep you warm all day long. Today I’m actually showcasing how HEATTECH layers keep you warm underneath your sweaters and jackets, but they are also the perfect basic layers for a stylish look. I combined two of my favorite Uniqlo items with this gorgeous faux fur vest and chic accessories to stay on trend and warm to the core! It’s definitely gotten a little colder these days in SoCal although I know it doesn’t compare to elsewhere – I mean I’m not even wearing tights in this post. But it definitely is cold enough to wear a scarf :). I started this year with curating a new collection for Morning Lavender and we put together a great set of new feminine dresses, romantic skirts and stylish, easy-to-wear pieces like this sweater dress that can also be worn as a loose top over jeans. I love versatile pieces that I really get a lot of use out of. I also really love my job and even more so, I love being able to share it with you all here! I added some fabulous over-the-knee-boots to complete the look with some color and style. This was the first time I wore the boots and I hope they don’t sag over time – a problem I have found with over suede over-the-knee-boots. Do you have a favorite pair of over-the-knee-boots?! If so, please share in the comments section below! Over-the-Knee Boots – Ivanka Trump find similar HERE. Earlier I shared my favorite yellow maxi skirt and now I am showing how to dress it up for the holidays. Pair it with a fun sweater, a sparkly necklace and a classic Chanel handbag and you got the perfect holiday look! By the way, I love Ann Taylor and ASOS because they both have petite sizes! It’s always hard to find clothes for my 5’0 frame and I usually have to hem everything, but this maxi skirt was the perfect length. 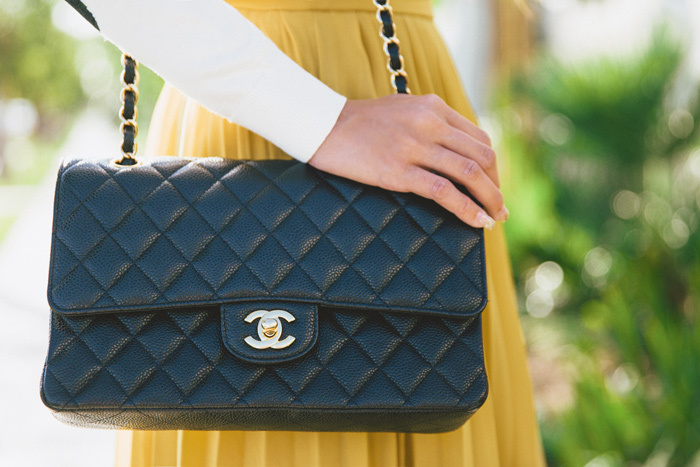 A side story about my Chanel handbag. I splurged on this after completely booking out my 2nd year as a full time wedding photographer. I had always wanted one and this was my pat on the back to myself for all of my hard work of running my own business. To this day, it’s a reminder of my determination and success in my business. I love it for this reason and also because it’s so classically beautiful! Maxi Skirt – ASOS similar HERE find similar yellow maxi skirt – HERE.